We began building our influencer network way back in 2009! Since then we have been to blogging conferences and influencer meet-ups from coast to coast, connecting with the people who power our business. We believe influencer marketing works when it’s authentic content from amazing creators, like you. We welcome established influencers looking to diversify their business and grow their digital community. Our network is 5,000 influencers strong, and if you’re selected to join, you’ll receive exclusive opportunities sent directly to your inbox. Projects we work on range from small, in-person events to long-term ambassadorships with major brands. Once you’re accepted, we’ll keep you in the loop via a monthly email newsletter and our private Facebook group. We love to collaborate, so we encourage you to share your suggestions or ideas of how you can work together with us. Don’t hesitate to reach out at HelloSociety@EverywhereAgency.com. How do I join Everywhere Society? Easy! Fill out the application here! Give us a few days to look through your application. If you are accepted, you’ll receive a welcome email and tweet! If you do not get accepted, you’ll still receive an email. Keep working on your content and try again soon! What do I need to be accepted into Everywhere Society? Everywhere Society requires that you have at least 10,000 followers or UMV’s on one social platform or blog. You must consistently post (at least once within the last month) and produce quality photos and content. How do I find my UMVs or unique monthly users/views? Log into your Google Analytics account. The Unique Monthly User is listed on the Home dashboard under Users. Just make sure to change the date range to the last 30 days. How do I see or receive opportunities? As an Everywhere Society member, you’ll receive monthly emails with current opportunities and instructions on how to apply for the campaigns. To avoid our emails landing in your spam folder, add hellosociety@everywhereagency.com to your contacts. Be sure to join our exclusive Facebook group to receive additional updates about newsletters and opportunities. How do I know if I'm following FTC guidelines? Following FTC guidelines is an essential component of complying with campaign requirements at Everywhere Agency. This infographic below, created by Mediakix in January 2018, is a helpful guide to know if you’re following FTC guidelines. Please don’t hesitate to reach out to your campaign point of contact at Everywhere if you have any additional questions! How do I grant access to my Facebook Business Manager? How do I promote a Pinterest Pin? You must make sure that you convert your Pinterest to a business profile. Click here for the step-by-step guide to boosting a pin on Pinterest. You will typically be paid within 7-10 days of filling out your permalinks form after the completion of a campaign. The permalinks form will ask for specific deliverables including blog links, blog page views, social share links, and boosted post screenshots. We cannot pay you until we receive your links. We will also need a signed IRS form W-9 or W-8 to keep on file. You will be compensated via PayPal, unless otherwise agreed upon. How do I get the Society badge on my site? 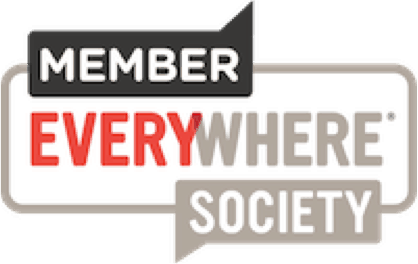 Show your Everywhere Society pride by sharing our badge on your site! Grab it here. Tell them to apply here and to list your name in the form when asked how they were referred to Everywhere Society. If your referral is accepted into Everywhere Society, we will send you a little token of our appreciation! How do I get picked for a campaign? How do you decide which influencer to choose? Everywhere Agency fields through all applicants, and based on the client’s criteria, we share our top choices and a short description of why they would be a good fit for the project. Some clients base their criteria on location, demographics, reach, engagement, or content. While we wish we could pick everyone, in the end the client chooses the final selections. You can read more about our selection process here. This is why it is important to keep your profile up to date!